A childrens bespoke embroidered bath towel makes a unique gift! A childrens bespoke embroidered bath towel makes a unique gift! Choose the embroidery design you like the best. Choose the Text. 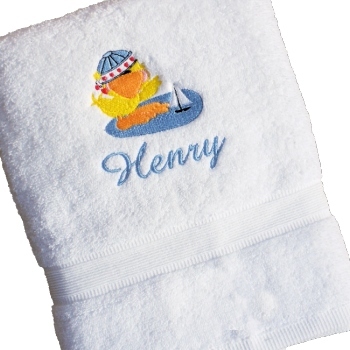 A childrens bespoke embroidered bath towel makes a unique gift! Choose the embroidery design you like the best. Choose the Text. Choose the Colour. This combed cotton 500gsm bath sized towel measures 75 x 125cm . Your choice of towel colour too!